Are you a fan of medieval times? Have you always wanted to participate in a Knights' Tournament? Well... now is your chance! 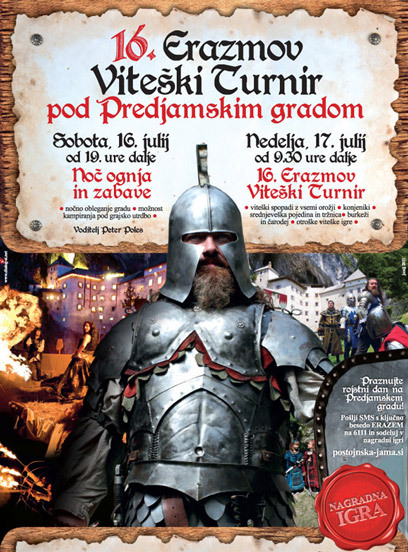 The traditional Erasmus Knights' Tournament will take place this weekend on 16th and 17th of July in front of Predjama Castle near Postojna, Slovenia. It is a perfect setting for such an event. Even George R.R. Martin - author of the bestselling fantasy series A Song of Ice and Fire liked the place. During a recent visit to Predjama Castle he stated that he might include the castle in the series. If by any chance, you are not familiar with this epic series, the first season (A Game of Thrones) has just been aired on HBO. If you decide to go, amongst other things you will have a chance to witness a castle siege, a performance by flag throwers, burning of a witch, knights' blessing, demonstration of the skills of archers, swordsmen and horsemen, group combats, combat for a banner and much more. You will also have a chance to participate in a medieval market and a genuine medieval feast. Detailed information about the event is available here (click the "more" link below the text). We were at the tournament while touring Slovenia in 2004, and thought about going back again, do you have any idea when the tournament will be held this year? This information is not so easy to be found... I don't know why they announce it so late every year. However I have found out that in 2012 the Erasmus Knights' Tournament (Erazmov viteški turnir 2012) will be held on 21.7.2012 and 22.7.2012 in front of Predjama castle. An update regarding this year's (2012) Erasmus Knights' Tournament: I was at the castle just today and they said it won't be held this year. They plan to do it every other year from now on.